Both pistachios and almonds offer numerous health benefits. When considering adding them to your diet, it is helpful to know what types of benefits each nut is most noted for as well as their calorie count and nutritional content. In comparison, based on a 30 gram serving, raw almonds and raw pistachios have relatively the same calorie content, total fat content, fiber content and protein content. Both nuts are sodium free and cholesterol free. They compare similarly in fiber and sugar content. Pistachios provide Vitamin A and C which is not found in significant amounts in almonds. Pistachios provide 4% of the daily recommended amount of calcium while almonds provide 10%. Pistachios provide 8% of the daily value of iron while almonds provide 6%. As the following description of benefits will indicate, pistachios and almonds have both similar and distinctively different health benefits. Including both types of nuts in your diet will help assure that your body is getting the specific vitamins and nutrients it needs to function at its best. Pistachios are helpful in reducing LDL cholesterol and increasing HDL cholesterol. 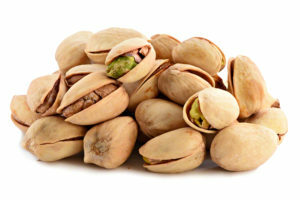 The vitamin A and vitamin E in pistachios help reduce inflammation. Inflammation has an adverse effect on your overall health. Pistachios are an excellent source of phosphorous which makes it highly beneficial in the prevention of diabetes. 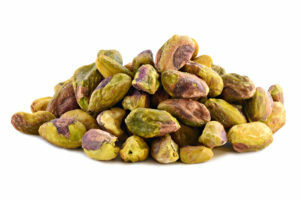 The vitamin 6 in pistachios supports the nervous system, boosts the immune system and promotes a healthy brain. Adding pistachios to your daily diet can provide vitamin B6 that is needed to maintain adequate blood oxygen levels and proper hemoglobin counts. You may want to buy bulk pistachios for their anti-aging benefits. 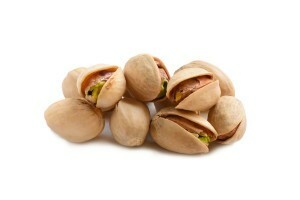 The vitamin E in pistachios helps fight aging by keeping your skin looking youthful and your hair healthy and strong. Pistachios contain antioxidants that help fight against age-related macular disease. Pistachios can be included in a weight management plan due to the benefits derived from their high fiber and high protein content. Another benefit of pistachios is the antioxidant properties they have which help reduce the risk of cancer. Almonds are also a heart healthy food. In addition to helping lower LDL cholesterol the flavonoids work in conjunction with the vitamin E in almonds to reduce the risk of heart disease. Making almonds a regular part of your diet can help build strong bones and teeth. Almonds are beneficial to your brain health and nervous system. The fiber content of almonds makes them a beneficial part of a weight loss diet. A distinguishing factor of almonds is that they are the only nut that is alkaline forming. Without the proper balance of alkaline in your body, you are at a greater risk for osteoporosis and weight gain. Without enough alkaline in your body, your energy level is likely to be low and your immune system weak. The pre-biotic properties of almonds enable them to promote gastrointestinal health. Almonds are beneficial in the prevention of colon cancer. The folic acid content of almonds makes them a good addition to an expectant mother’s diet. You may want to buy bulk almonds so that you’ll have some available for a quick snack when you’re experiencing an energy slump. Eating a handful of almonds is a healthy way to boost your energy. The fatty acids in almonds help reduce inflammation thereby preventing the adverse health conditions that inflammation can cause.